If you’re looking for the ultimate white water thrill - to ride rapids no man has ever before dared to attempt, there is only one craft for you: the Bublick. Engineered in Russia, the Bublick is designed to allow white water thrill seekers to experience the excitement of the world’s most dangerous rapids with a high degree of safety. From our personal experience, we can honestly say that the Bublick is an adventure you will never forget; an adrenaline charged trip through roaring white water chasms strewn with deadly boulders - all of which you and your guide negotiate safely enclosed within the protective shield of the Bublick’s thick hull. We introduced the Bublick to Nepal in 1998 and have maintained a 100% safety record ever since. 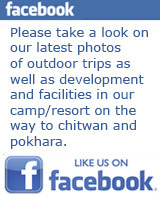 Today it is still exclusive to "WhiteWater Nepal Pvt. Ltd." in Nepal. So, if you think you’re up to the challenge of the Bublick, contact us for more information. At the end of 1999, WhiteWater Nepal and a team from Russia together made the first ever descent of one of the most dangerous sections of the Upper Arun Gorge. 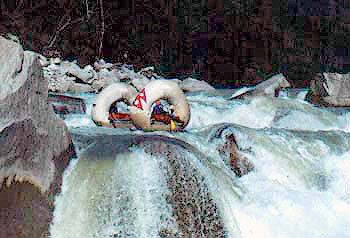 As this was the first descent of the river we carried the Nepali flag, though it did get rather wet at times! This proved to be a very successful expedition, as can see from the photos in our gallery. We received a great deal of television coverage from the national network in Nepal and our subsequent documentary is often shown on national sports channels. If you wish, you are welcome to join us on similar ground-breaking expeditions in the future. As these involve a great deal of planning and are dependent on prevailing conditions, it is important that you contact us as soon as possible if you are interested - and if you think you are up to it! This is a high risk, challenging activity not to be undertaken lightly. It is essential that anyone considering joining us on one of our bi-annual expeditions organizes suitable insurance and is aware of the risks to life that are involved in an expedition of this nature.